Measurements were taken utilizing a Telatemp 438-3 Reversible LCD liquid crystal thermometer. In this image, a tan color indicates the temperature is above a reference value, green is equal to it, and blue is below it. 64ºC Cell 3 backskin (internal cell +20ºC, 84ºC). 95ºC Cell 2 backskin (internal cell +20ºC, 115ºC). 130ºC Cell 2 point backskin (narrow field pyrometer). 60ºC Cell 1 backskin (internal cell +20ºC, 80ºC). 40ºC Frame temperature (mounted vertically). The left side contains three groups of sensor photos adjacent to the cell they measured. Each group shows the same sensor photographed under the three different conditions. The three images were cropped and placed next to one another to make relative changes in color easier to see. For example: In the cell 2 set, the lowest photo (no shade) shows a brighter green 60 and a dimmer blue 55 then the one above it which has a dimmer 60 and a brighter 55. This indicates that cell 2 was slightly cooler when shaded and managed by FOZHS. When FOZHS was switched off and normal Bypass took over, we see the bright green 95 in the upper photo of that same strip. 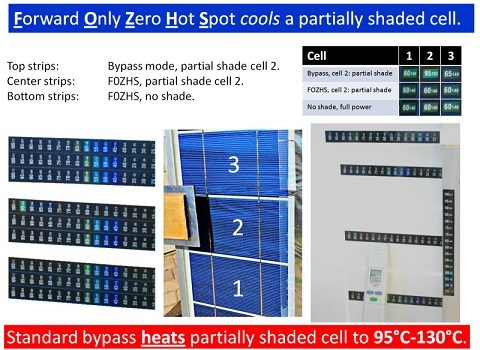 The top sensor indicates Bypass data; the middle indicates FOZHS data in partial shade and the bottom indicates the no shade temperature in full production. Data for cell 1 and 3 are presented as controls. Data for cell 2 indicates temperature dependence on shade and bypass or FOZHS protection methods. Read here for the basic principles of FOZHS. Read here for experimental data on FOZHS.